The one big problem with Scientology is that ultimately it is not rooted in reality but in the writings of its founder L. Ron Hubbard. While Hubbard used terminology that relate to observable realities, much of the reasoning in Scientology gets so thoroughly confused and divorced from actual experience that it overwhelms any work-ability that may be there. Let’s take Hubbard’s view of reality for example. He asserted that even what we understand as physical reality (consisting of matter, energy, space and time) is “the product of agreed-upon considerations mutually held by life” yet no two people in the world, including highly trained Scientologists, can sit down and have something materially manifest by agreeing to some shared thoughts or considerations. What we can see is that the physical reality has existence of its own while our thoughts and perceptions are a product of what we understand to be our consciousness. Consciousness forms or creates PERCEPTION of what we understand to be the physical reality, and that perception can be altered quite significantly to result in a different EXPERIENCE of reality which in turn can give someone an illusion that the perceived existences themselves are created by consciousness. LIE, 1. a second postulate, statement or condition designed to mask a primary postulate which is permitted to remain. (PXL, p. 180) 2. a statement that a particle having moved did not move, or a statement that a particle not having moved, did move. (PXL, p. 180) 3. an alteration of time, place, event and form. (PXL, p. 187) 4. invention with a bad connotation. (PAB 49). With definitions like this, some lack of clarity on the subject of lies is sure to follow. Is It Really Thoughts That Control Actions? The control center is CAUSE. It directs, through emotional relay systems, the actions of the body and the environment. It is not a physical thing. 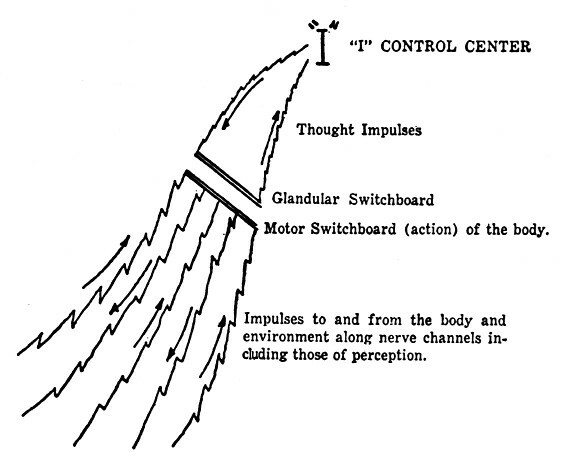 Here is a diagram of the control center, “I,” in relation to the emotions and the body and environment. The total function of “I” is the estimation of effort. It thinks and plans and resolves the problems of future effort. – Do you think about moving your arm every time you want to move your arm or do you just move your arm? – Do you have to generate some kind of an emotion every time you want to move a part of your body or do you just move it? Neither thought nor emotion is required to move body parts. What is required is one’s PRESENCE in the body part that one wants to move and an INTENTION to do so. In fact, there are many instances where there is ACTION WITHOUT THOUGHT especially when it comes to learned and automated movements such as when driving a car, playing a piano, swinging a tennis rackets while playing tennis or simply walking down the street. There may be plenty of thought when those actions are first learned, but thereafter there is no thinking linked to the actions. There is no need to engage in complex explanations to justify Hubbard’s model – it should just be discarded along with an idea that your “total function” (as “I”) is the estimation of effort. That’s reducing a human being to a level of some factory robot. A confusion can be defined as any set of factors or circumstances which do not seem to have any immediate solution. More broadly, a confusion in this universe is RANDOM MOTION. If you were to stand in heavy traffic you would be likely to feel confused by all the motion whizzing around you. If you were to stand in a heavy storm, with leaves and papers flying by, you would be likely to be confused. If, as a switchboard operator, you had ten calls hitting your board at once, you might feel confused. But is there any answer to the situation? If as a shop foreman you have three emergencies and an accident all at the same time, you might feel confused. But is there any answer to that? Confusion is the basic cause of stupidity. To the stupid all things except the very simple ones are confused. Thus if one knew the anatomy of confusion, no matter how bright one might be, he would be brighter. And not only in the realm of the job, but in life itself, when failure approaches, it is born, one way or another, from confusion. To learn of machinery or to live life, one has to be able either to stand up to confusion or to take it apart. We have in Scientology a certain doctrine about confusion. It is called the Doctrine of the Stable Datum. If you saw a great many pieces of paper whirling about a room they would look confused until you picked out one piece of paper to be the piece of paper by which everything else was in motion. In other words, a confusing motion can be understood by conceiving one thing to be motionless. In a stream of traffic all would be confusion unless you were to conceive one car to be motionless in relation to the other cars and so to see others in relation to the one. The switchboard operator receiving ten calls at once solves the confusion by labelling, correctly or incorrectly, one call as the first call to receive her attention. The confusion of ten calls all at once becomes less confusing the moment she singles out one call to be answered. The shop foreman confronted by three emergencies and an accident needs only to elect his FIRST target of attention to start the cycle of bringing about order again. Now, in teaching a young aspirant to use a machine, he failed to grasp your directions, if he did, because he lacked a stable datum. ONE FACT had to be brought home to him first. Grasping that, he could grasp others. One is stupid, then, or confused in any confusing situation until he has fully grasped ONE FACT or one item. Confusions, no matter how big and formidable they may seem, are composed of data or factors or particles. They have pieces. Grasp one piece and locate it thoroughly. Then see how the others function in relation to it and you have steadied the confusion and, relating other things to what you have grasped, you will soon have mastered the confusion in its entirety. Selecting or clearly defining one thing as Hubbard suggests under his “Doctrine of the Stable Datum” could be seen as an introduction of some order, but really this is rather too simplistic of an approach to be practical in many real life situations. Even with respect to “traffic” someone would have to know many rules in order to be able to predict the motion of traffic and see it as an orderly pattern of motion – there is no selecting of one car or “stopping” anything required. PREDICTABILITY is a key factor in resolving confusion. Order makes things predictable. Hence, a messy room for an outsider can seem confusing while for the owner of the room, it can contain a hidden order mapped out in the person’s mind who knows where everything is. If the room was to get cleaned up and organized, the owner could feel initially confused until he established a new mental map according to a new form of arrangement.